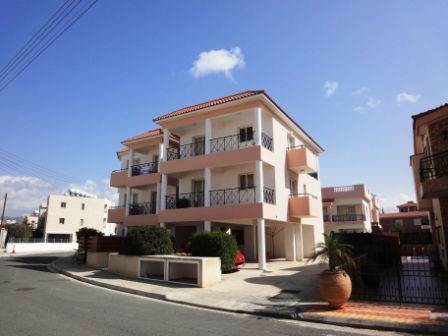 Cyprus Property Blog by Cleo : Apartment in Kato Paphos with Title Deeds - Modern Kitchen, Nicely Furnished - NOW SOLD! • 67 sq. m., 1 bath, 2 bdrm apartment - €99,950 EUR - Title Deeds - NOW SOLD! Kato Paphos, Cyprus - This spacious top floor apartment is located in the Universal area of Kato Paphos, a short distance from the local shops and restaurants of the sea front and harbour area. It is part of a small complex of only 5 apartments with shared swimming pool, and it's own separate storage room and allocated parking space. The accommodation features an open plan living room, with lounge, dining area and end kitchen. The kitchen is well equipped with built-in oven, electric hob and extractor fan, fridge/freezer and washing machine. There are two balconies with distant sea views, (one covered and one uncovered) accessed via patio doors. The bedrooms are both double size, with fitted wardrobes and access to a balcony, and there is a modern family bathroom. Immaculately furnished in a very modern style, and with high quality goods, this apartment represents great value for money. Title deeds are available.